Bully! was a term Theodore Roosevelt frequently used as an exclamation of something he thought was superb, referring to his US presidency as the "bully pulpit". Roosevelt was plagued by bullies as a youth. He wore glasses, and was weak and sickly growing up. As a teenager he took up weightlifting and boxed in college. He became a war hero. Seldom written about, but true, was that Theodore Roosevelt studied judo, eventually earning a brown belt, and even built a small dojo in the White House. Underneath the veneer of bravado and arrogance that the bully exhibits lies fear. Fear of being stood-up to. Fear of being found out that (s)he is actually a coward. Bullies typically were themselves the victims of abuse and/or unrequited love as children. Bullies hate themselves unconsciously, and project their rage/fear onto others. When a bully is effectively confronted, they will usually back down, and attempt to seek out a new victim. Many people that take up the martial arts were/are victims of bullying. Okinawa, as a culture, was "bullied" by the Chinese, the Japanese, and later, European expeditions. The Okinawans, understandably, had little use for the concept of martial philosophy. 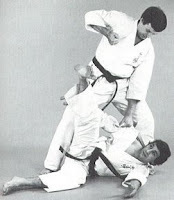 Karate-jutsu, reality combat, became the only practical course of study. Unfortunately, sometimes bullies only understand one thing. And unfortunately some people enter the martial arts because they are bullies themselves and like to exhert their power over beginners and easy targets. Get bullies out of martial arts! I agree with "sji". I've seen that, and agree that bullies should not be allowed to do that. Thinking much about the Karate Kid references you made recently, there is another value that the movie taught me which is related to this, which is that you are meant to use your martial arts ability in defense, not as an aggressive action. Man, Karate Kid II pops into my head especially for that one. Daniel would constantly resist fighting, and was forced to defend himself, hence the only time he used his skills. That's what it's about. Not being a bully is also something I'm very conscious of with my small son. He is very tall and big for his age, and he has some serious learning disabilities, so he does come from a point of weakness from that standpoint, and has the physical capacity to use for the wrong reasons. I don't want a big bully for a son. I want a gentle giant, who is a defender for himself and others, not the offender to be feared. Also being of that age, I also remind him that superheros, real or imagined, never get the bad guys unless the bad guys strike first. They don't use their karate, or superpowers until they need to. They use their brainpower first, as they are smart. Bullies rely solely on their emotions and act on that, rather than use their brains while respecting their emotions to seek answers. As disciplined martial artists, I believe we all agree that bullying is wrong and that the use of force, against bullies, should only come as a last resort. That said, bullies in the martial arts should be immediately and handily dealt with by the instructor. There is no room in the arts for such foolish behavior. Sometimes, bullies understand nothing except their own language. Idealism is pretty. But also irrealistic. Martial arts helping bullies is an utopy. Funakoshi strived to make better persons. But that's what happens when you put weapons in people that are power-hungry. They use those weapons. Bullies do not belong in a dojo, and to my limited experience, they do not last very long in a dojo. Their mental perceptions, and expectations seem to rebel against the humility required to learn how to apply their skills by starting a beginner under the guidance of the higher belts. Obtain victory without conflict. That is one of our dojo precepts (is probably one of most dojo precepts as well). That is the first thing I thought of whilst reading this post and the comments following. Bullies are, unfortunatly, everywhere. Even in our "grown-up" world there are plenty.